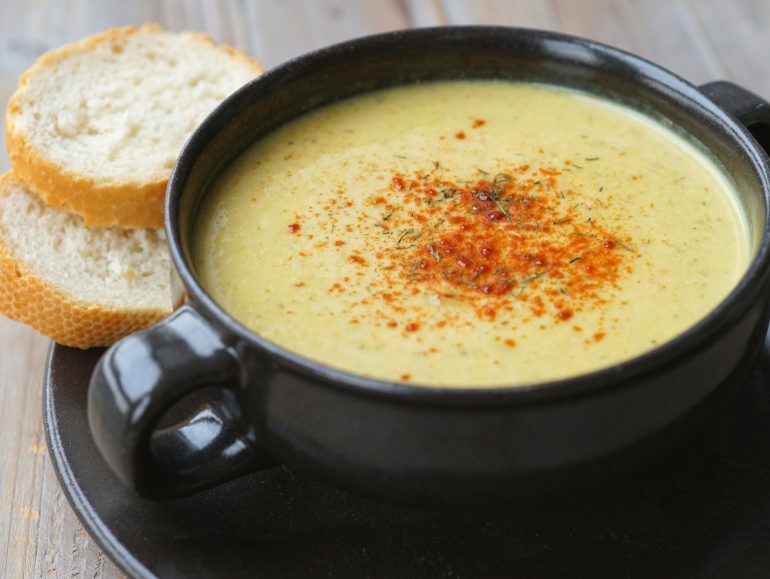 This vegan soup so really creamy, tasty and delicious, I just had to share it with you. The recipe was inspired by the Cheddary Broccoli Soup from Isa Does It by Isa Chandra Moskowitz. I am a huge Isa fan and this book is one of my favorites. She does nog have lot of low carb recipes, but if you know your cauliflower rice and rutabaga mash, you can easily transform most of them into a low carb favorite. The cheesy flavor of this soup comes from a combination of miso, nutritional yeast, lemon juice and unroasted cashews (you could use soy cream or almond butter for even fewer carbs). You can get these ingredients from a health food store. I always have them on hand for vegan cheese cravings. This soup is quite quick to make, but make sure to soak or boil your cashews in advance if you do not have a high powered blender. Serve on its own or with some crackers or low carb bread. Preheat a large pot on medium high heat and sauté the onion in the oil until soft and fragrant. Add the garlic and sauté for half a minute more. Add the broccoli, carrot, turmeric, 750 ml water and bouillon and bring to a boil. Cook for about 10 minutes until the carrots are soft. In the mean time, make the cashew cheese sauce. Puree the soaked cashews in a blender along with the miso and nutritional yeast into a completely smooth liquid. Depending on the strength of your machine, this could take up to several minutes. When the vegetables are cooked, puree the soup. It's nice to have a little texture from the broccoli and carrots, so don't make it too smooth. Add the cashew sauce to the soup and allow to simmer for another 10 minutes so it can thicken. Finally, add the lemon juice and freshly ground pepper. Taste the soup and add a bit more lemon juice, pepper or salt if you think it needs that. Serve on its own or with low carb bread. Oh yum! I was planning to make this soup as I recently went through Isa Does It and bookmarked all recipes that can be made keto/low carb. This one's still on my to do list, sounds yum! I'm a big fan of broccoli soup anyway, keen to try a cheddary version. Hope you like it Alynda! In the process of making this now! But would love to know the nutritional info per serving, specifically calorie and carb count if you have it? Thanks! Had to circle back to say - IT WAS AMAZING! Can't wait to have it for dinner too, and pass the recipe along to my Mom. Thank you! Hi Vickie, I don't always have the energy to calculate nutritional values for every recipe. Also, the carb value depends on the exact ingredients you use, so your most reliable option is to calculate it for yourself. Websites like cronometer.com can be helpful for this. I do not see the nutrional values here??? ?